What is the Rescued Pet Trauma Fund? Every year, the Humane Society of Missouri receives sick or injured animals that need special medical treatment before they can be placed for adoption. 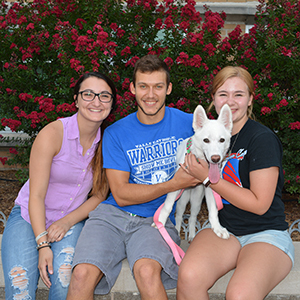 Your contribution to the Rescued Pet Trauma Fund enables the Humane Society of Missouri to go the extra mile for animals that have suffered abuse or neglect and require medical treatment that is beyond the scope of regular adoption center procedures. A good Samaritan found "Trinity" (also pictured above) wandering the streets with a severe injury to her right front leg. 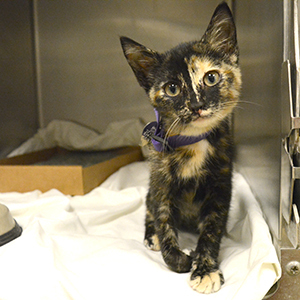 Veterinarians found that the kitten was otherwise healthy and with surgery to remove the injured leg, Trinity could have a happy life. Thanks to the Rescued Pet Trauma Fund, Trinity is now thriving in her forever home! 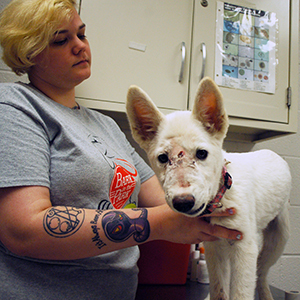 Upon arrival at HSMO, veterinarians determined four-month-old "Kurtney" had been attacked by another dog. She was underweight, suffering from wounds around her muzzle, and she had a broken jaw. Weeks of specialized treatment to rehabilitate this sweet puppy would not have been possible without the Rescued Pet Trauma Fund. Shortly after her treatment was completed, Kurtney went forever home!! Thank you for supporting the Rescued Pet Trauma Fund!